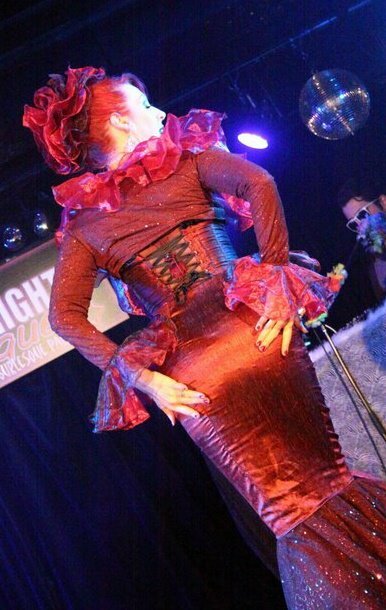 21st Century Burlesque’s interview with our own Burgundy Brixx! We thought you might enjoy this interview with our own Burgundy Brixx by 21st Century Burlesque as a part of their series profiling the competitors for this year’s title of “Reigning Queen of Burlesque” at the Burlesque Hall of Fame’s “Tournament of Tease” coming up on June 2nd 2012 in Las Vegas! As we count down to the Burlesque Hall of Fame Weekend, let’s find out more about the eleven talented temptresses competing for Reigning Queen! I have asked each of them about their lives, personalities, preparations and plans, so that those who don’t already know them well can learn a little about them and their work, and those of us who know them better can enjoy their thoughtful and entertaining responses. If I looked you up in a twinkling, rhinestone covered burlesque dictionary, what would the entry for ‘Burgundy Brixx’ say? A born entertainer who uses her innovative mind, performance training and sense of whimsy to create unexpected burlesque magic. Works tirelessly to create sustainability for the art form of burlesque through producing, educating and performing. I’m fortunate to be able to do what I love each and every day. Producing a weekly show is extremely time consuming, but it’s now my official job and for that I’m proud and grateful. My week’s work consists of booking my future performers, designing my weekly fliers, gathering information from my performers of the week, promoting the event(s) and seeking out new promotional angles and sponsorship opportunities. Since I perform in my show each week, I’m also constantly working on new numbers, perfecting old ones, rehearsing and creating costumes and props. I feel an obligation to both my fans and to the burlesque community at large to try to be excellent whenever and wherever I perform. There’s always someone in the audience seeing a burlesque show for the first time, and my goal is to seduce and delight and educate that person so that they’ll want to attend more burlesque shows in the future. I also teach classes to introduce women to the art and tradition of burlesque, as well as ballet for grace and style at the beautiful studio I opened with two of my colleagues – The Vancouver Burlesque Centre. Although it’s all extremely demanding and I rarely (if ever!) have a day off, I consider myself to be blessed for the opportunity to live and sustain myself by means of my own creativity and art. What has been the highlight or defining moment of your career to date, and also in your life overall? A few years ago I met a former burlesque artist living in Nelson, British Columbia named Judith Stein. Not knowing anything about her except what I heard from a few of the other Legends at BHoF in 2009, I asked the other board members of the Vancouver International Burlesque Festival if we could invite her to perform in our festival in 2010. Ms. Stein took the stage and grabbed hold, literally stopping the show. I was asked to introduce her onstage, so I was watching from the wings. I will never forget the thrill I felt in my heart when she turned upstage near the end of her number, head thrown back, beaming, joy pouring from her entire gorgeous body; the fact that I was a small part of making that moment happen was the most magical moment of my career to date. Right then I set my sights on trying to help Judith get to perform in Las Vegas at BHoF for Legends Night (in her long career, she had never got to play Vegas!) and although my Canadian immigration issues prevented me from seeing her hit the stage last year, the phone call I received from her right after she rocked the house was one of the most gratifying and magical moments I have ever experienced. Can you tell me a bit about your chosen act? Why have you chosen it, is it an old trusted act, or a new routine? Have you made any special changes or ‘upgrades’ to it for BHoF? This act is one I debuted exactly one year ago at the Vancouver International Burlesque Festival in a show with a live R&B band, but it’s to a piece of music I’ve been planning on doing a number to since I first set foot on a burlesque stage, so it’s extremely gratifying to have my long-standing fantasy become a reality in so many ways. I designed and created every single piece of the costume myself, which I’m extremely proud of. Costuming is a huge part of my process, since I studied it fervently in college along with theatre arts. When I’m really proud of my costume, it adds profoundly to my excitement to perform. It’s a number I absolutely LOVE performing on every level, and I think the audience has a great time too. It’s just me – no props. There are some slight upgrades to the costume (of course!) and to the opening sequence, but otherwise it’s a solid number that I’m just thrilled to share with my burlesque peers on the big BHoF stage! Is competing something you enjoy, or that pushes or encourages you to excel? I’ve had a hard time coming to terms with the concept of competition in the past, but this past year I’ve been able to look beyond my personal fears and inhibitions (we all have ‘em!) and into the broader scope of the idea to find that there really is so much value in healthy competition. It challenges us all to challenge ourselves to reach into the depths of our souls to create the best possible art and audience experience that we can, without settling for the comfort of mediocrity. Art will always be relative, but excellence is appreciated by all! Why is BHoF special and important to you? What are some of your favourite memories from past years? My first year attending BHoF was entirely overwhelming. The Thursday night showcase blew me away and I couldn’t imagine that there could be three more nights of world-class, innovative entertainment to follow! That Friday night was my very first experience witnessing Legends of Burlesque perform. You will NEVER forget your first time. It’s a life changing, invigorating, emotionally draining experience; the rest of the weekend I was teary-eyed, exhausted from applauding, and walking around like a zombie in a crazy cloud of love. The joy of the weekend, that spirit of family that Jennie Lee brought to her peers is so important for us all to take back to our individual communities. Equally important is the fund-raising mission of the weekend in support of the museum and it’s work; building awareness of our history and working to both retain our fading past while sustaining a vibrant future for all of us. How would you spend your year as Queen – do you have any specific plans or goals if you win? The Sustainability of Burlesque – it’s always my goal and the underlying project within all of my work. I believe there is room within the art form we define as Burlesque for a vast array of styles and flavours, as well as amazing future innovations not yet presented. But we all have a responsibility if we want to sustain our world. Understanding and respecting the past is the way we create the future. We call ourselves a community, but are we truly acting like one? If we draw on each other’s strengths, the richness of our history (both written and unwritten) and leave room for diversity, there will be a day when the umbrella of burlesque is so great that we all can work, live and love under it, side by side. What are your dreams and hopes for burlesque in the future, and yourself as a part of it? My goal is to see burlesque legitimately recognised as its own individual art form. Dance. Theatre. Music. Burlesque. While burlesque uses aspects of dance, music, and theatre, it cannot be categorised within any one of them. Once burlesque is recognised as its own entity, all the myriad styles and forms within our world will be able to blossom and take shape, and there WILL be room for everyone. It may not happen in my lifetime, but I’m never going to stop crusading for that goal. May 17, 2012 | Categories: Uncategorized | Tags: BHoF, Burgundy Brixx, Burlesque Hall Of Fame, Burlesque Legends, Burlesque Museum, Judith Stein, Pandora and The Locksmiths, The Road To Reigning Queen | Comments Off on 21st Century Burlesque’s interview with our own Burgundy Brixx!